Types: Understand the features and properties of different foam types and align them to your sleep needs. Some common type of foam mattresses are gel, latex, memory foam, and reflex. Density: This factor directly affects the durability, longevity, support, comfort, and affordability of the sleep surface. The higher the density, the more comfy and durable the mattress. Foam mattresses last for 5-7 years before showing signs of wear. However, the density of the foam shouldn't be less than 1.5 lbs/ft3 . Comfort/Support: Foam mattresses offer exceptional comfort, pressure-relief, and support, thanks to their incredible conforming ability. Customers with osteoporosis or any other arthritic pain greatly benefit from foam beds. Couples who share bed: Most foam mattresses have remarkable motion isolation. Your sleep remains undisturbed as your partner, pet or kids move in the bed. Temperature Regulation: Do you sleep hot? 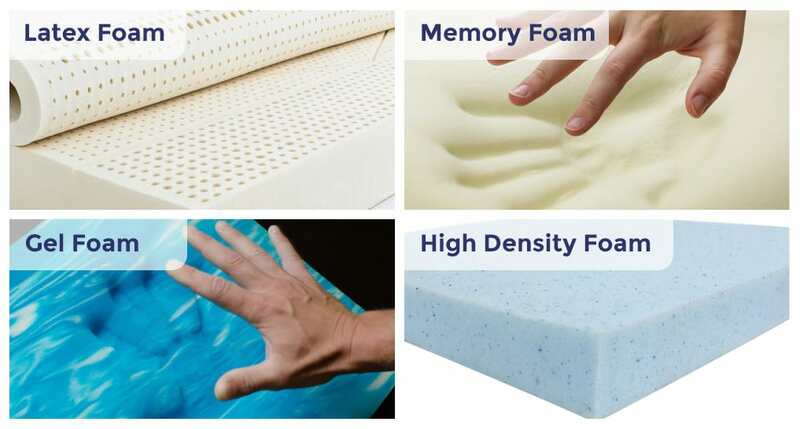 high-density foams usually have poor airflow properties. Check out the temperature regulation system of your foam mattress. Some mattress makers add phase changing graphite, copper, silver, and various other materials to increase the heat distribution in a mattress. Try it before you buy it at a store! Off-gassing: Do you dislike strong chemical odor? Foam mattress owners, especially those who sleep on memory foam, complain about off-gassing. The smell dissipates in a couple of days though, trick is to keep the room ventilated. Thickness: Foam thickness improves its durability and performance. Unless you're extremely lightweight, mattresses more than 10 inches high offer the best support to your body. Density: If you want your memory foam last longer, look for high-density, preferably more than 5.5. Denser memory foams are also comfier and more supportive. You can expect a high-quality memory foam mattress to last for 7-10 years. ILD: Indentation Load Deflection (ILD) refers to the pressure required to change the shape of the foam surface. It is associated with different comfort levels of the foam. Comfort/Support: The remarkable conforming ability of memory foam ensures unmatched targeted support for pressure-relief of achy joints. These mattresses are available in all types of comfort levels so you can choose the most appropriate one. Couples who share bed: Remarkable motion isolation makes memory foam mattresses best for peaceful bed sharing. Look for special edge reinforcement foam or springs at the mattress parameter. Temperature Regulation: Memory foam is often associated with "hot sleeping." however, mattress makers use various materials like charcoal, and metals like copper, silver, and titanium to improve the heat distribution and cooling ability of the memory foam. Off-gassing: off-gassing is one of the most prominent drawbacks of memory foam mattresses. However, most memory foam mattresses are CertiPUR-US certified, stating them free from harmful chemicals and safe, even for the infants. Thickness: Although the thickness of a mattress affects the comfort quality, the thickest mattress is not always the best. Much depends on your body size and shape. Thicker foams often restrict movement on the bed and have weak edge support. Therefore, medium range i.e. 9-12 inches is usually the safest choice. Durability: On average, a memory foam mattress lasts for six to seven years. However, the high-density mattresses can last for more than a decade, even after regular use, due to sturdy construction. Certifications: Certifications help put an approval seal on the mattress construction, safety and standard. The best certification out there is Certipur-US. A memory foam mattress certified by them is chemical-free and safe for everyone, including infants. Types: The latex mattresses are either natural, synthetic, or a blend of both. Benefits and properties vary for all. Therefore, note the latex type and research its pros and cons before buying. Processing: Dunlop and Talalay are two popular natural latex foam processes. Each has unique properties. For example, Dunlop beds are firmer, good for pressure relief and budget friendly. Talalay has better contouring, is soft in feel, and may be high priced. Density: The higher the density of the latex mattress, the heavier and the more durable it becomes. The denser foams are more comfortable and supportive, and hence, pricier too. On average, latex mattresses last longer than foam and innerspring one. High-quality mattresses can easily last over a decade. The ILD range of 25 to 35 is the best for the most comfort and conforming ability. Comfort/Support: Dunlop mattresses are more supportive than Talalay latex and offer incredible spinal alignment, best for back pain management. The Talalay is plusher and provides more cushioning for precise support and relief of joint aches. Couples who share bed: The latex foams are remarkably responsive to all body structures and sleep positions. The subtle bounce is another plus. The motion transfer is minimal and latex mattress edges are relatively secure. Hence, you can use the maximum sleep surface without rolling off the bed. Temperature Regulation: The latex is more breathable than other foams because of its open-cell structure. Firmer latex mattresses are more refreshing than softer ones. Since soft latex foams contour your body, they tend to heat up a little. Off-gassing: Almost 11% of latex mattress owners complain of an initial off-gassing. The natural latex is free of toxins. No harmful chemicals are used in its construction and the odor is associated with the rubber used in the construction. Thickness: Latex foams are more compact and resilient compared to other foams. That is why even relatively thin latex mattresses offer you excellent support. A 9-10 inch latex bed can easily support heavier people without bottoming out. Freedom of movement: Freedom of movement on latex mattresses is comparatively more comfortable than that on foam surfaces. You do not feel stuck in the latex beds. Best for people who change the sleep positions quite often during the night. Motion isolation: Latex beds have excellent motion isolation characteristics. Eco-friendly but Costly: Latex mattresses are costly. They are made using sophisticated materials and intricate processes for perfecting minute details in construction. However, natural latex is more eco-friendly and thus, a healthier choice. Latex mattresses offer better pressure distribution across the sleep surface than polyurethane beds. Don't buy latex mattresses if you have never tried it in real-time before. Many people regret buying latex as they experience it has less contouring than memory foam beds. So it is highly recommended to test it out in a showroom first. Density: Hybrid mattresses have foam in the comfort layer and pocketed coils in the support core. The density of the comfort foams affects the durability, overall support, and adjustability to body types. The greater the density of the foams, the better. Hybrid mattresses are usually pricier, comfier, and more durable than other mattress types. Coils count and gauge: The support core of a hybrid mattress can have any of the different coil types. The number of coils and their gauge also vary from mattress to mattress. Higher coil count and lower coil gauge, both increase the support and durability of the mattress. Ideal coil gauge for a balance of comfort and durability is around 12-15. Comfort/Support: The combination of springs and the comfort foams in the hybrids provide you the ultimate comfort and support. The support provided by the resilient coils is further enhanced by the contouring foams that provide targeted pressure-relief. Quilted foam cover, pillow-top and euro-top mattresses enhance the comfort due to the presence of additional foams. Thus, you can experience a plush, cozy feel on a remarkably supportive bed. Couples who share bed: Most hybrids use pocketed coils, moving independently of each other. Hence, minimal motion is transferred from one side of the bed to the other. Moreover, most hybrids use lower coil gauge springs or high-density foam rails at the mattress parameter to strengthen edge support. Temperature Regulation: The hybrids usually sleep cool because of the free air passages among the coils. Latex or breathable foams in the comfort layers enhance the refreshing feel. Although memory foams tend to trap heat, hybrid mattresses usually use innovative temperature regulation technologies to improve cooling. The contouring foams and the unrestricted airflow through the coils regulate the sleep temperature efficiently. Off-gassing: Since there is foam in the comfort layers, some customers do report some off-gassing. However, the odor dissipates in a couple of days. Thickness: Hybrids are usually thicker and the contouring foams and the resilient coils offer an excellent balance of comfort and support for average and heavyweight persons. However, if you're on the lighter side, your weight is not enough to compress through the thick comfort foams and experience the hybrid mattress support. Freedom of movement: The use of coils in most of the hybrid mattresses, combined with the super motion isolating foam surfaces, gives the sleeper great freedom of movement. A lot of foam layers in your hybrid certainly improve the overall comfort and support but decreases mattress durability. An uncomfortable, lumpy, noisy, or too bouncy innerspring mattress causes frequent awakenings during the night, which has a direct negative impact on your sleep quality. The spring bed core stabilizes the mattress, so be mindful of this factor while selecting a spring bed. Coil type: A spring mattress's comfort and overall support depends on the type of coils used in its design. Different coil structures offer a unique kind of support to your body. If you are prone to joint aches and backache, it is important to consider this factor before buying a mattress. Pocketed Coils - Excellent pressure relief properties and motion isolation. Hourglass Coils - Inexpensive option and provide a hard sleep surface. Continuous Coils - Adequate motion isolation for a low price. Coil Material: Although all coils are mostly metallic, they vary significantly in terms of quality. Sleep experts suggest that the best spring mattresses contain tempered coils in the structure. It means that the steel coils have been heated and cooled during the manufacturing many times for proper solidification. So no matter how much weight is exerted on the mattress, the coils will always spring back to their original form without deforming or getting stuck in one position. Consequently, the tempered coils also have more durability than the non-tempered springs. Pressure-relief and spine support: In general, spring mattresses do not provide adequate pressure relief to sore areas like hips, knees, back, legs, shoulders, neck and even head.You may add a comfort layer to the spring mattress but it won't be as good as other types of mattresses for pain relief. It can also affect your spinal alignment which can lead to poor posture, specially if the mattress sinks-in or has inadequate lumbar support. Budget: When going for a spring mattress, it is better to keep your budget between $200 to over $2000. Usually, you will find a Queen size spring mattress for about $950. Pure innerspring sleep surfaces are more affordable than hybrids. Edge support: Innerspring mattresses are popular for their exceptional edge support. You may come across sleep surfaces with a hard-wired edge, which not only increases mattress durability but also improves support on borders. Motion transfer: As innerspring is associated with increased motion transfer, it is important to note if your spring bed has any technique to enhance motion isolation. If you are a combination sleeper and change your position often, this factor is especially crucial to consider. Best sleep position: Spring mattresses would work best for people who tend to shift in their sleep quite often. If you sleep in just one position all night, the coils may exert significant pressure on your sensitive areas including hips, shoulders, legs, neck and lower back. A spring surface with a padded top layer may be an incredibly soothing and cozy choice. Durability: One of the significant problems that occur in spring mattresses is the durability issue. The average longevity of innerspring mattresses is three years. After this period, most people start to experience rapid sagging and wearing out, after regular use. Temperature regulation: innerspring sleep surfaces have excellent air flow. They are suitable for people who tend to have hot, sweaty nights. Pocketed coils have spaces between them. This structure allows proper airflow that helps the heat to dissipate away from the surface, providing the sleeper with a cool, refreshing sleep.